Cachena are small cattle from Portugal. They are a triple-purpose breed which are raised for milk, meat production, and also used for draught purposes. Along with Protugal, they are also bred in Galicia, Spain. Also there are similar but larger cattle available in Portugal which are known as Barrosao or Barrosa cattle. Sometimes Barrosa and Cachena cattle are considered different variants of the same breed. 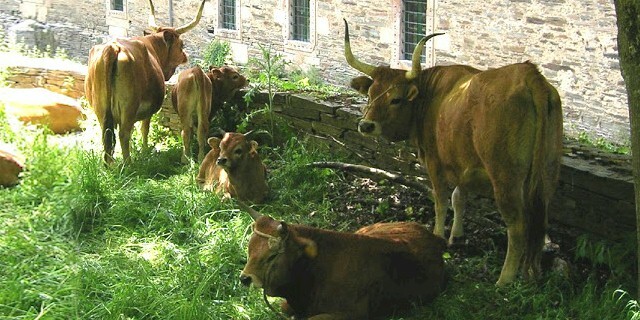 Cachena cattle were bred from the brown and yellow local cattle in Northern Portugal. The breed was originally bred in the Vila Real District in the past, which is an agriculturally poor district in the extreme north of Portugal. In that area, the climate is hot and dry in summer, and cold and humid in the winter. Little fertile ground is available there. Cachena cattle are distributed around the low mountain range regions of the communities in the Spanish natural park Baixa Limia-Serra do Xurés in the frontier region to Portugal. In addition they are spread in the region around the Ourensic village Olelas and in the Portuguese Peneda-Geres National Park. A Cachena Cattle herdbook was founded in 1990. Cachena cattle are one of the smallest cattle breeds of the world. They have a well-proportioned body and big lyre-shaped horns. They are usually light brown to yellow with dark brown nuances around the whithers. The average height of both bulls and cows is equal or less than 110 cm. But the bulls are normally taller than the cows. Average live body weight of the mature cows is around 390 kg. And the mature bulls on average weight around 550 kg.